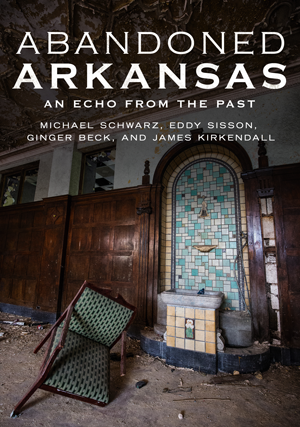 MICHAEL SCHWARZ, EDDY SISSON, GINGER BECK, and JAMES KIRKENDALL are members of Abandoned Arkansas, a group of curious photographers who focus on documenting and preserving the history of lost places across the state. Michael’s love of the lost was literally stoked by the fires of the burning Majestic Hotel. Eddy dedicated years of effort to restoring the good times and memories of Dogpatch USA. Ginger loves the thrill of highlighting the forgotten via social media, and James can negotiate his way into some of the best sites in Arkansas and beyond. Together, the team is dedicated to remembering and saving the history of Arkansas.